I had my attic blown full of treated cellulose a couple of summers ago to the tune of R50. The insulator guys thought I was crazy. Guess they were right because I get a crazy grin every time I open my electric bill. We had an ice storm last week that left a couple of inches of ice and snow. I started watching in my town for north facing residential roofs that were still white a few days after the storm. Unfortunately, none were. Mine was pure snow white for 9 days. 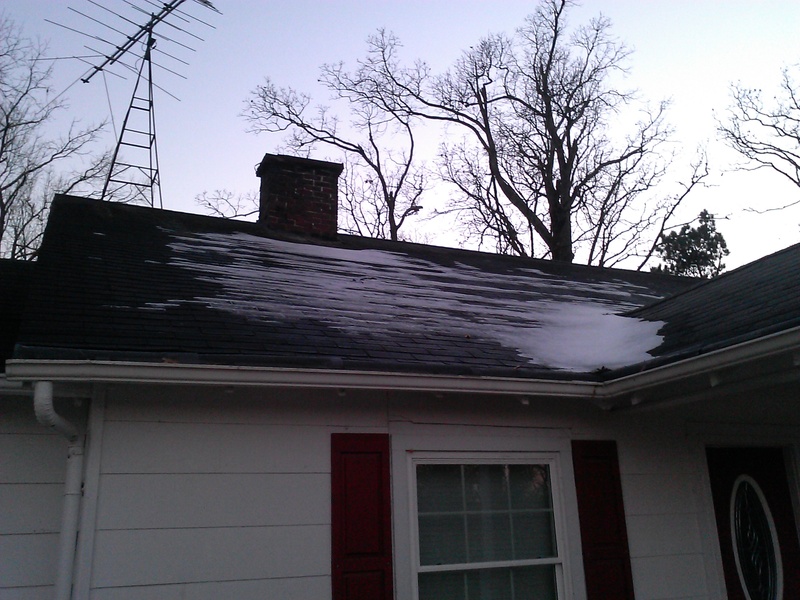 Today it got up to 55 degrees and even my snowy roof gave up the ghost. This is all that remained as the sun set this evening. Attic insulation- probably paid for itself four times over in the past year and a half. What does this have to do with duckweed? Cindy, I digress occasionally to share other aspects of my sustainable lifestyle. It’s all interconnected and a marvelous journey. sounds groovy 😉 I need some!